There aren’t many Upper Valley ponds with completely undeveloped shoreline. Pout Pond, in Lyme, is a treasure. 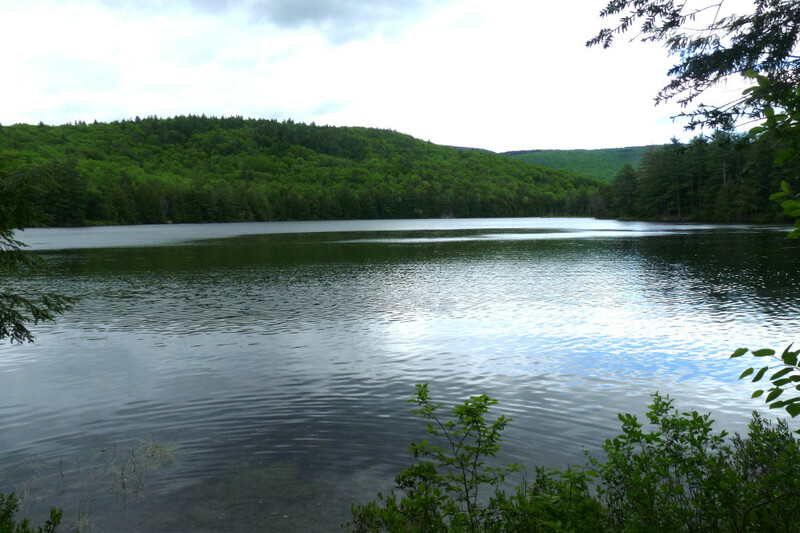 There arenâ€™t many 40 acre ponds with no development along the shore — Pout Pond is a place of rare natural beauty. 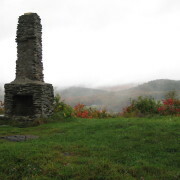 In 2011, Put and Marion Blodgett worked with the Upper Valley Land Trust to ensure future generations would be able to visit and experience the pond as it is today. Their neighbors and friends pitched in to help. The conservation of this place with public access to the pond is remarkableâ€¦ a gift to us all, and to our kids and grand-kids. 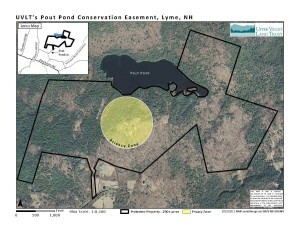 Pout Pond is located about 1 mile northeasterly of historic Lyme Center in Lyme, NH off Pout Pond Lane. The pond is entirely surrounded by just two large properties. The watershed is largely forested with dense hemlock near the pond, and lovely mixed hardwoods away from the shore. UVLT’s conservation easement covers almost 300 acres including 4810Â± feet of mainland shoreline plus 615Â± feet of island shoreline along Pout Pond. The Pout Pond outflow, an unnamed tributary to Grant Brook, exits the pond at the southeastern edge and flows southerly, eventually into Grant Brook, an important water resource stream system in Lyme. The conservation easement provides for pedestrian access throughout much of this privately owned woodland and pond frontage. There are no developed trails with signs, maps, kiosks, etc. Instead, you may wander the existing woods roads and trails or explore off-trail where you wish. 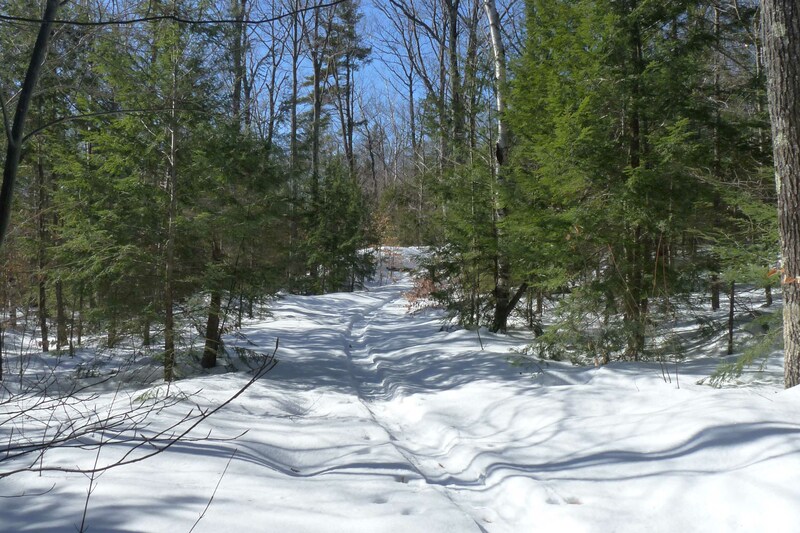 The local community uses the existing paths on the property year-round for snow-shoeing, nordic skiing (not groomed), hiking, and shoreline fishing in Pout Pond. Please note: There is a 32 acre area surrounding the house where the landowner may post against access by the public to ensure their privacy if necessary. So if you see signs that limit access, please respect the landownerâ€™s rights and privacy by adhering to the signs. Click here for pdf of public access map. You can find the Pout Pond Conservation Easement Area by traveling to Lyme (where there is a small green, Lyme Country Store, etc.). 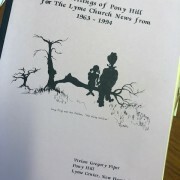 Head east on Dorchester Road for 1.9 miles, just past Lyme Center village, and take your first left on to Acorn Hill Road. Proceed up the hill for Â½ mile and turn right onto Pout Pond Lane. This is a narrow, dirt road. Drive .8 miles to 75 Pout Pond Lane on the left. There is no parking area provided on the property. Park carefully on the shoulder of Pout Pond Lane where appropriate, but not in or along the driveway. To get to the pond, you may walk up the driveway about 1400 feet (.3 miles), and proceed along woods roads/paths or through the woods to the left of the driveway and wander your way to the pond. 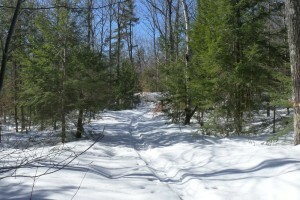 Ski tracks in woods at conserved Pout Pond property. â€¦remember that the property is privately-owned land. â€¦respect any signs that you see. … let us know what you saw and did!